Pilates exercise for elderly adults works wonders because it is low impact compared to other forms of exercise, which means it is not as severe on the joints as traditional aerobic exercise classes and traditional weight lifting machines. You will focus on breathing and quality-controlled movements, not repetitions. Conventional workouts teach you to focus on how many repetitions you can do and how much weight you can lift, which tends to build short, bulky muscles that are more prone to injury – especially in older adults. Pilates works the “Core”, elongates and strengthens the muscles at the same time, which, in turn, improves joint mobility and elasticity. In effect it is a kinder and gentler way to exercise for the older adult who doesn’t need to be beaten down. And...most importantly, it helps to improve your BALANCE! "Pilates develops the body uniformly, corrects wrong postures, restores physical vitality, invigorates the mind and elevates the spirit." - Joseph Pilates. Pilates is unique in that it systematically exercises all the muscle groups in the body, the weak as well as the strong. The exercise geriatrics Pilates make you stronger, more flexible, and less likely to fall because they re-educate your body to use all of your muscles, not just the superficial ones. By strengthening both your large muscles and the deep, smaller endurance muscles that are responsible for your strength, they take the strain off the larger muscles and give them added support. Bottom line: less pain, greater range of motion, and fewer falls. How Pilates Exercise for Elderly Persons Helps to Improve Walking Posture, Balance, and Gait Speed? What does Pilates have to do with walking? Well, let’s first look at how we walk. We stand upright with; hopefully, good posture and then we balance ourselves as we reach out with one leg to take a step shifting our weight onto the forward leg. Unfortunately, as we age and the core gets weaker we overwork our hip flexors to lift the leg as we walk, these are the muscles that shorten and tighten and, in effect, start to pull us forward until we fall over. Strong abdominal muscles are the key to your body working as a unit. 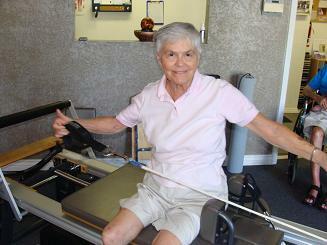 With Pilates exercise for elderly the “Core” or the center of your body needs to be your focus. Ultimately every movement and exercise for the older adult, especially walking, should be initiated by first stabilizing the core of the body which involves contracting the deep abdominal muscles. 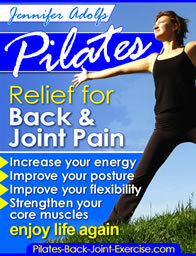 Find suitable Pilates exercise for elderly adults in my newly Pilates ebook to improve your strength and balance today! It is an aligned body. The goal is to organize the body so that the spine is stable and the abdominal muscles are engaged, the limbs are active and supported, the feet are mobile and the breath is conscious, even and regular. 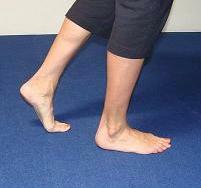 This posture perfect Pilates form will help contribute to an improved, relaxed, and more fluid gait speed while walking. If your form is currently not in this perfect plumb line it will affect your posture, which, in turn, affects your balance and walking. Pilates exercise for elderly adults helps to correct this un-natural length/tension relationship in the body. In essence, Pilates stretches muscles that are tight and strengthens those that are weak to help realign your body to its natural form. It was developed specifically with the needs of the older adult in mind. The classwork and apparatus training is very individualized in that all the students can adopt variations and modifications of the exercises to their own abilities. Exercise Geriatrics Pilates combines both the suppleness and flexibility you find in yoga, as well as the strength building you find doing weight training in the gym. Find certified Studio Instructor's in your area for individual training by going here. Modifications such as using pillows for the head when lying on the back, or using pillows under the pelvis when lying on the stomach can alleviate neck and back pain and tension. If you have a hard time sitting on the floor do the exercises on a raised table or platform. 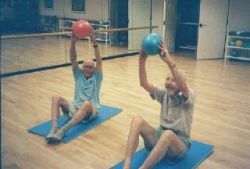 Leave Pilates Exercise for Elderly adults and find more ways that Pilates can benefit you!